Game of Thrones all knew that winter would be coming and now it is there and so is this Game of Thrones Winter Is Here T-Shirt. 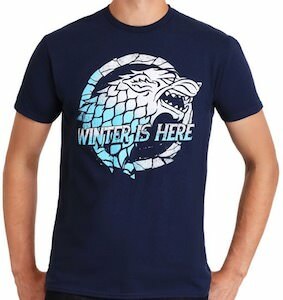 The dark blue t-shirt shows the famous Direwolf from the Stark logo and the wolf is placed in a circle and on top of all that is says “Winter Is Here”. You can get this Game of Thrones t-shirt in men’s sizes Small – 2XL and it is made from 100% cotton. A t-shirt like this is just perfect for a true Game of Thrones fan and besides that everyone who like great TV just needs this t-shirt. The very popular saying ” Winter is Coming ” from the television series Game Of Thrones is one every fan knows. Now you can have a little Kitchen fun with it and twist the saying a little to fit this really cool item of a personalized cutting board. On the top of this Game Of Thrones cutting board you will see in the center a large House Stark Direwolf logo detailed and looking great. Above the Direwolf you see the engraved saying ” Dinner is Coming “. On the bottom you will find an area that you can get custom engraved, perhaps your family name. The cutting board has slightly rounded edges and is available in 3 different sizes. Small 8 x 12 inches, Medium 9.8 x 13.8 inches, and Large 11.8 x 15.7 inches. You can also choose from 3 different wood types of Cherry, Oak and Walnut. 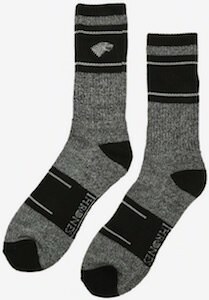 Now Game of Thrones fans can wear a tie that fits with the Stark house because this is a Direwolf necktie. The necktie is available in 12 different colors and will look great when you are dressing up. On the Game of Thrones tie it shows the famous sigil of the Stark house in white and that looks great on any of the colored neckties. 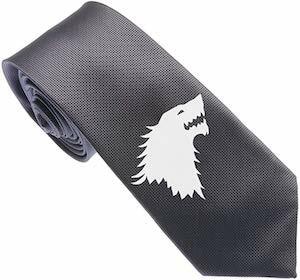 Wearing a tie now also shows people around you that you are a true fan of Game of Thrones and the Direwolf. The Stark logo looks good on almost anything and this tie proves that. 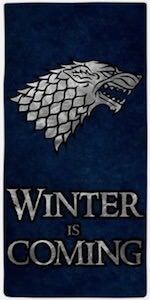 If you are a Game of Thrones fan that is going to the pool or beach then you just have to check out this Winter Is Coming beach towel. The front of this Game of Thrones towel you can find a blue background and then it has the Direwolf logo of the Stark family and below it in big letters it says “Winter is Coming”. It maybe strange to be on the beach with a towel that says “Winter Is Coming” but all the Game of Thrones fans will love to see it lying in the sand. The towel is 30 x 60 inches and nice and soft with the printed front being made from polyester and the back is made from 100% cotton making it just the perfect towel for you. 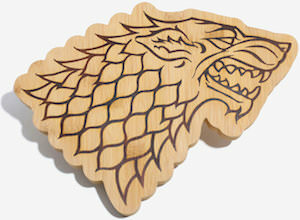 If you like cooking and Game of Thrones then you need this Stark Direwolf cutting board. The cutting board is shaped exactly like the logo of house Star and that is the Direwolf. The Game of Thrones cutting board is 11 x 8 inches and is made from bamboo. 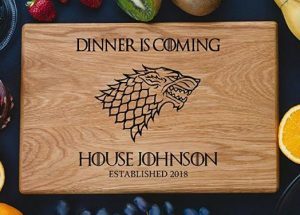 So now you can cut up your food on this amazing looking cutting board and then eat in front of the TV and rewatch all the Game of Thrones episodes starting with the once with Ned Stark in it as that is where it all started and where we first saw the Direwolf. If you are a big fan of Game of Thrones then you should check out this Stark table lamp. 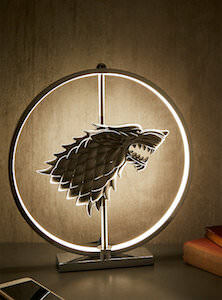 The lamp shows a 14.5 inches circle with in it the Direwolf logo from House Stark. The Game of Thrones lamp looks stunning in the daylight as it has a nice chrome look and the wolf has amazing details and you can see it by clicking the picture above. When lit up the lamp looks stunning thanks to the 90 LED lights that are built into it. A true Game of Thrones fan and collector just deserves to have this amazing light in their home as it is just one of those items you are going to love forever. 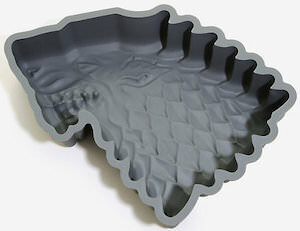 If you like cake and Game of Thrones then you need this Stark wolf cake pan. The gray silicone cake pan is shaped like the Direwolf so you just need to add the cake mix and your Game of Thrones will be ready in no time at all. The wolf cake pan is 10 x 6 x 2 inches and has all the details build in so that even the plain cake will look like the famous House Stark logo. Now you can have a Game of Thrones party and that means birthday parties, Game of Thrones marathons and more because we can always use a cake that looks great. 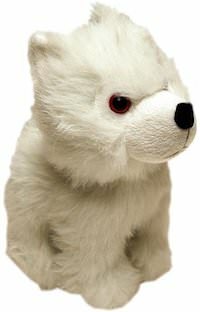 If you are a Game of Thrones fan then you are in luck as there now is a plush direwolf cub that you can own. 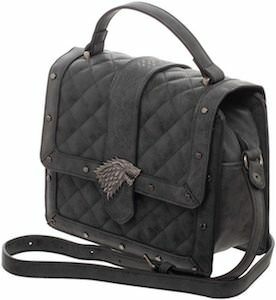 Sure we have seen John Snow and the tiny wolf cub and bow you can own the white wolf yourself. The plush direwolf is 9 inches and is a replication of the wolfs in Game of Thrones and it is an officially licenced Game of Thrones product so you know the wolf is as real as it can get. Plush animals are cute and now you can have one based on your favorite TV show Game of Thrones.